A.J.H. Repelaer van Spijkenisse collection, where first recorded in 1884. Anonymous sale; Christie's, Amsterdam, 6 May 1993, lot 98, as 'Attributed to Pieter Brueghel II'. with Johnny van Haeften, London. Private collection from 1996; Christie's, London, 7 December 2006, lot 31 (sold £3,256,000 to the present owner). G. Marlier, Pierre Brueghel Le Jeune, Brussels, 1969, p. 117. K. Ertz, Pieter Brueghel der Jüngere-Jan Brueghel der Ältere. catalogue, Vienna and Antwerp, 1997-8, pp. 336-42, no. 103.
no. E186, and pp. 221, 225-6 and 245, figs. 181-2. Brueghel der Jüngere-Jan Brueghel der Ältere. Flamische Malerei um 1600 Tradition und Fortschritt, 1997-1998, no. 103. This beautifully preserved picture, judged by the Brueghel expert, Klaus Ertz, to be 'of masterly quality' ('meisterliche Qualität'), is one of Pieter Brueghel the Younger's finest reinterpretations of his father's work. The prototype of 1559 by Pieter Bruegel the Elder (Kunsthistorisches Museum, Vienna) is one of the artist's undisputed masterpieces and one of the most recognizable of all the images within the Brueghelian canon. Five versions of the composition by the artist's son are known, of which only three are considered to be autograph: a picture in the Musées Royaux des Beaux-Arts, Brussels, a version sold by Christie's London, 7 December 2010, and the picture offered here. The subject provides the perfect vehicle for that unique blend of humorous storytelling and riotous anecdotal detail that have endeared the works of the Brueghels to generations of art-lovers. The theme dates back to thirteenth-century Burgundy but was treated in a wholly new and inventive manner by the Brueghels. The period of Lent in the Christian calendar commemorates the forty days and nights Jesus spent praying and fasting in the desert prior to his entry into Jerusalem and his eventual Crucifixion and Resurrection. Traditionally before Lent began all rich food and drink had to be disposed of, which often lead to giant parties involving the whole of the community. Such parties, which evolved into Carnivals, also recalled pre-Christian festivals and in the Brueghels' day were often criticized for their tendency to get out of hand. The subject of the present picture may also have been inspired by the kind of tournament that actually occurred in carnival processions, where a contest between the personification of Carnival or Shrovetide, in the guise of a portly male character, and Lent, personified by a skinny female one, added extra riotous humour to the proceedings. In the foreground of the present picture we can see precisely such a contest where the portly Carnival rides a beer barrel, with cooking pots for stirrups, and drunkenly brandishes a roasting spit at his adversary Lent. She, dressed as a nun with a beehive (a symbol of the Catholic Church) as a hat, defends herself with a baker's peel and two meager herrings; inexpensive fish that provided a staple diet during Lent when the eating of meat and other delicacies was forbidden. Around these two characters the mad partying of Carnival and the penitent devotions of Lent are evoked in a dizzying kaleidoscope of comic anecdotal detail, pitted in battle, both literal and metaphoric. As is frequently the case in works by the Brueghels, the left and right halves of the picture are constructed differently, with each side intensifying the effect of the other. 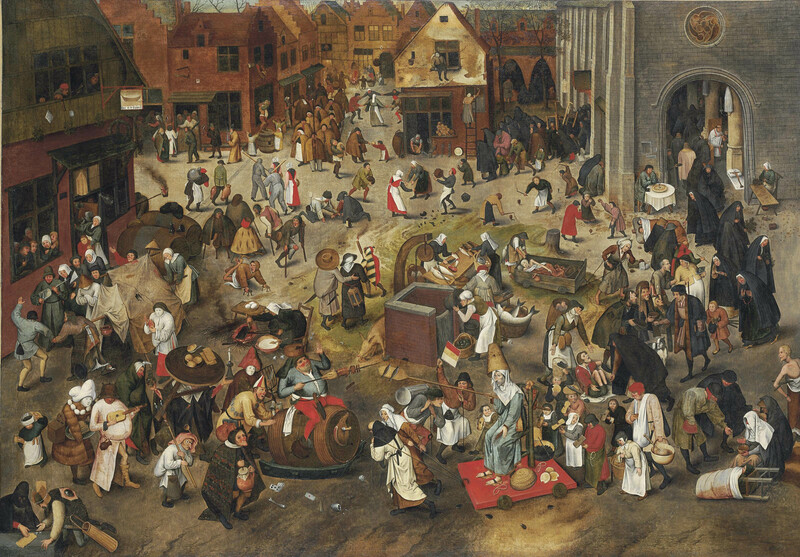 The left half of the picture belongs to Carnival, the right half to Lent, as the Tavern, on the left, confronts the Church, on the right, while in between stretches a surreally vivid scene of human activity, providing an encyclopaedic overview of all the customs and folklore associated with the seasons of Carnival and Lent, depicted as though contemporaneous. The composition is magisterial in its organization of content and form, with its bird's eye perspective enabling us to look down upon the sprawling mass of small figures scattered in a novel and ingenious manner over the picture space, while the groups of figures and their relationship to each other are subtly and rhythmically conceived. At the centre of the picture a well divides the painting along culinary lines: Lenten fish are sold on the right while the fatted Carnival pig snuffles in the mud on the left as a fool holding a torch passes by. In Brueghel's time, torches lit in day light symbolised folly and both Brueghel the Younger and his father used torches in this manner to illustrate the proverb of 'Bringing daylight out into the sun'. More carnival food is seen to the left of the pig as a woman cooks waffles over a fire. Further evidence of the populist folly and topsy-turvy world of Carnival is seen in the depiction of Carnival's followers. 'Rough Music' is played on a kitchen grill while an old lady beats a rommelpot, a jug covered by leather to amplify the sound, with a wooden spoon. Two of the Carnival Mummers wear a necklace of eggs and a cooking-pot-helmet while in the lower left corner gamblers in Carnival disguise play dice and a child wears a paper crown. In the tavern on the left people are watching a performance of The Dirty Bride, a popular farce mocking the love of a rustic couple. In the background a second tavern can be seen. People dance, as a man standing on a barrel drinks heartily to the delight of surrounding children, who cry 'the king drinks! ', while a man emerging from a window above empties a bucket of slops over him. Below, cripples wearing foxtails as marks of their presumed deceitfulness perform a grotesque dance for alms, while their bodily disabilities recall the spiritual disabilities of all mankind. The right side of the picture is dominated by the monumental gothic façade of the church from which, in contrast to the mayhem of the left side of the picture, the congregation emerges in two orderly processions. A wealthy merchant leads an elegant arabesque of black-clothed nuns, probably Beguines, from the front portal, and distributes alms to the waiting poor and lame. The churchgoers have attended a Lenten service as the statues are covered within the church. From the north portal a more modest congregation departs, some carrying their own chairs. The small branches they hold indicate that they have just celebrated Palm Sunday. The tonality and general atmosphere is darker as sickness and death are ever-present, prompting thoughts of penance and Lenten charity. The picture as a whole is a brilliant demonstration of the Breughels' unique ability to orchestrate acutely observed characterization and anecdote into original compositions of great imaginative power. The meaning of The Battle between Carnival and Lent has been endlessly discussed and interpreted (see K. Demus, F. Klauner and K. Schutz, Flämische Malerei von Jan van Eyck bis Pieter Bruegel d. Ä, Vienna, Kunsthistorisches Museums Katlog, Vienna, 1981, pp. 61ss.). But rather than propounding a didactic moral message, the picture is notable for its even-handed treatment of both Lent and Carnival. There is no obvious winner in this battle; Carnival may be rowdy but it is life affirming, just as Lent, while more sombre, displays compassion. The work is imbued with a spirit of independence and impartiality towards the phenomena it illustrates; effortlessly combining religion, folklore and humanism, it both celebrates and mocks the vitality and wit of the Netherlandish people. The anecdotal and imaginative breadth of works like The Battle between Carnival and Lent ensured the Brueghels' enduring reputation in Art History, but it is the mocking 'open-air lunatic asylum' quality seen in works like the present picture that has won them a new and more surprising audience among contemporary artists today. Only last year the Chapman Brothers in their show Die Dada Die at Cabaret Voltaire, Zurich, exhibited a School of Brueghel Crucifixion which they had re-worked, claiming that 'by adding their touch to that of Brueghel the Younger, Jake and Dinos create a direct link to the past and not just a representation of it. In so doing they create a bridge between the past and the present that reconfigurates [sic] our relationship to both'. VAT rate of 5% is payable on hammer price and at 20% on the buyer's premium.